Cover for December issue of VITA magazine, about drug use in Italy. 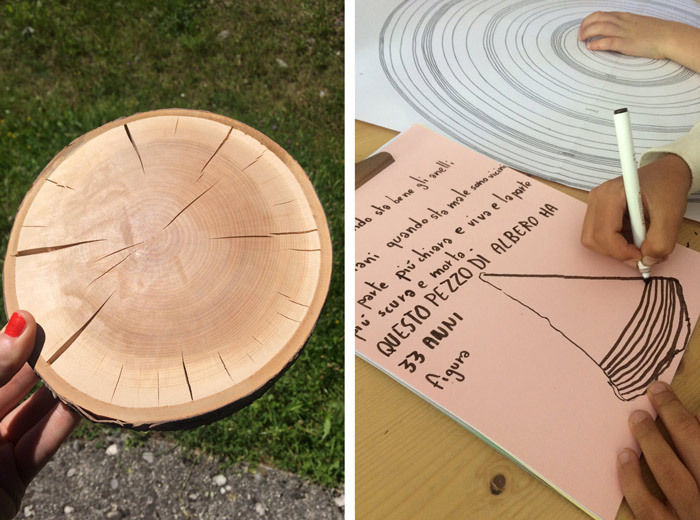 We had an amazing workshop session at Il Masetto, joined by dendrochronology expert (the study of tree rings, fyi) Stefano Marconi. He told us a lot of insights about how to guess the age of a tree and we sharpened our observation skills in the wood. Thanks Giulia Mirandola for the invite and the exquisite hospitality! 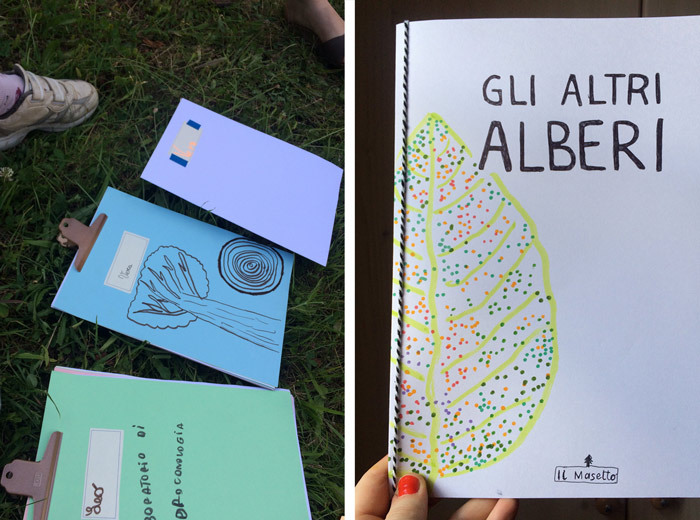 L'ALBERO workshop is based on the book we illustrated for Topipittori editions, within PiNO series that explored the connections between nature, drawing and childhood. Colours and custom wallpapers for the new semi-permanent exhibition of the amazing 19th C. toys collection Cavalli Rosazza in the glorious basement of Palazzo Chiericati — Musei Civici of Vicenza. Graphic design in collaboration with Cecilia Cappelli. 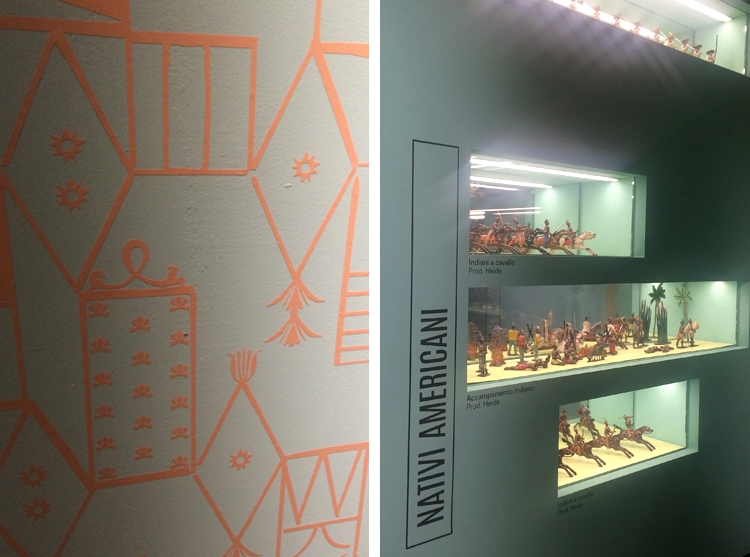 The exhibition is quite unique: we hope to get better pictures soon! Exhibition design Emilio Alberti, Mauro Zocchetta and Piero Beggiato; set-up structures Stand Up. Curated by Giovanni C. F. Villa; produced by Fondazione Roi. Happy to finally present the extended project LO SGUARDO SELVATICO / THE WILD EYE. 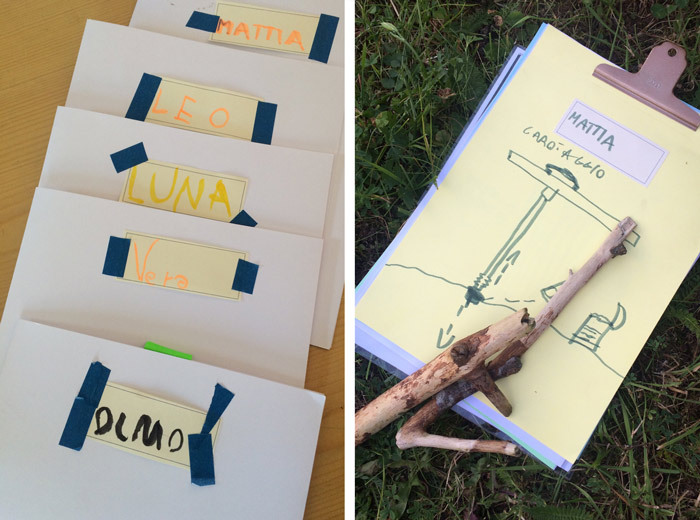 It started from a workshop and a residency at the Orto Botanico di Bologna during the Summer 2017, invited by Inuit Editions. Botanical gardens are the Garden of Gardens, it is the place where naturalia, artificialia and mirabilia get confounded with each other, becoming a fascinating world on its own. Invited to this artist-in-residency project, we started to ask ourselves what we really were observing and looking at. We tried closing our eyes, taking off our glasses so we could avoid focalizing on things, we moved away, we got really close. In botanical gardens, the wild nature finally is ordered: in fact, someone observed carefully on our behalf, establishing standards, spaces, relations, geometries, families, sets according to differences and analogies. My eye is the latest of many, it focuses on a plant with a very long story, maybe it sees, maybe it doesn't even observe. This book was born as an observation workshop, alternating between personal and group efforts, in and out of phase, experimenting, in a nonlinear manner. It puts images in order like they were stickers in an album: slowly, one at the time, savouring the blank spaces yet to be filled. Part game, part mystery. The texts are polyphonic captions: we asked seven people, all different from a human and professional standpoint, to react to the photos in the attached stickers sheet. They are other sets of eyes, looking upon our view, creating a circular dance between various possible imaginary worlds of what we saw, what we thought we were seeing, or maybe what we just imagined. LO SGUARDO SELVATICO / THE WILD EYE has been superbly Risograph printed by Marco Tavarnesi of Inuit Editions and it has been presented at Bologna Children's Book Fair 2018 during the exhibition "The Greenhouse" at Galleria B4, Bologna. Some pictures from last Bologna Children's Book Fair: Studio Fludd and Anne Laval, lost in the world of botany, with The Greenhouse — a double exhibition of illustration and Risograph printmaking at Galleria B4, curated by Inuit Editions. We gave tridimensional space to our editorial project The Wild Eye, born in the Summer of 2017 as a workshop of observation and polyphonic visual experimentation at the Botanical Gardens of Bologna. New drawings have been added to the narration, opening the next step of investigation. 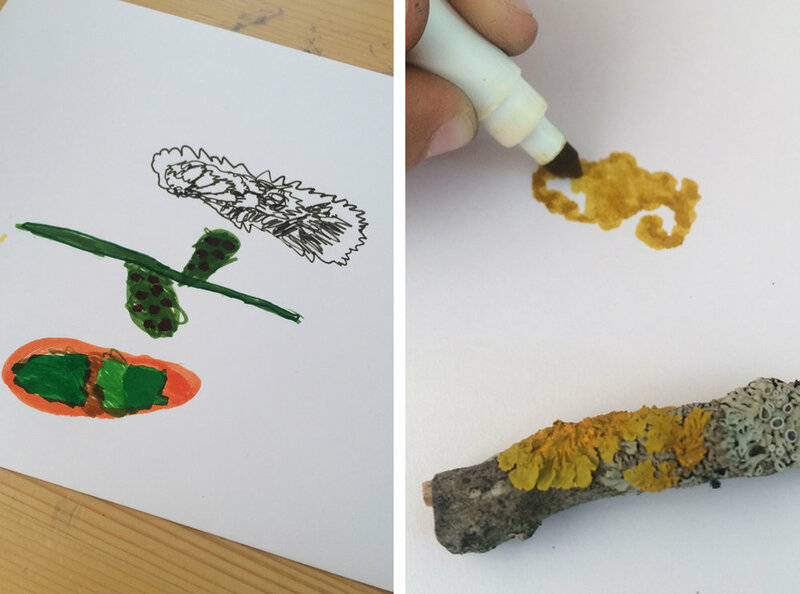 Botanical drawing activity for kids, that follows the topic and process of L'ALBERO — recently published by Topipittori and illustrated by us. The first two workshop were at Libreria Pel di Carota, Padova and Circolo dei Lettori, Torino. You can find the book here. 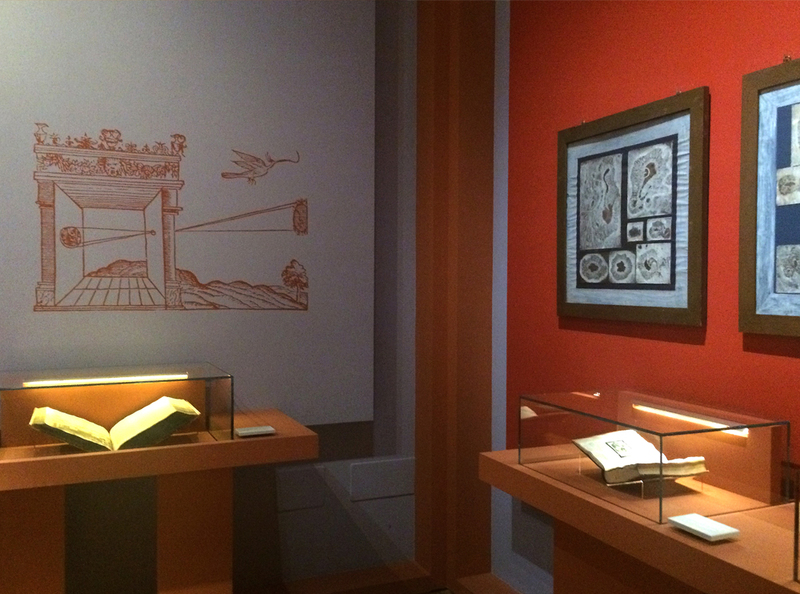 A glimpse of our work for the new exhibition RIVOLUZIONE GALILEO, eclectic journey crossing Art and Science, built around Galileo's outstanding figure. We took care of exhibition colour, illustrations and graphics. Typography and graphic design in collaboration with Joseph Miceli, using his font Bianco Sans and Serif. On the walls we exploded images from the ancient books showcased in the cabinets. The colour itinerary is based on seven hues, with a combination of four colours in each room. RIVOLUZIONE GALILEO is curated by Giovanni C. F. Villa and Stefan Weppelman. 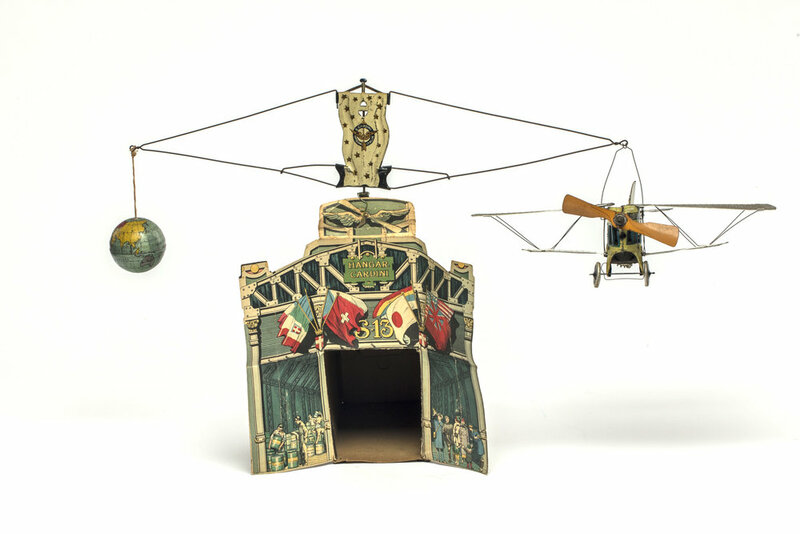 Exhibition design by Studio Alberti and Mauro Zocchetta. Exhibition setup: StandUp srl. Promoted by Fondazione Cassa di Risparmio di Padova e Rovigo; production Silvana Editoriale. Until March 18th at Palazzo del Monte di Pietà, Padova. GALILEO'S observation DIARY OF SUN SPOTS, JUNE AND JULY 1612. L'ALBERO Guida pratica e poetica alla vita arborea - text by Silvana D'Angelo, illustrations by Caterina Gabelli and Sara Maragotto / Studio Fludd, published by Topipittori. What is a tree? What can we learn about it with our eyes? A book about observation and transformation. Thanks to Giovanni Gabelli for the the scientific consultancy, and to Giovanna Zoboli, Paolo Canton, Anna Martinucci and Lisa Topi to made it happen, after a journey of two and a half years. You can get it here. An interview about the creation process here (ita). 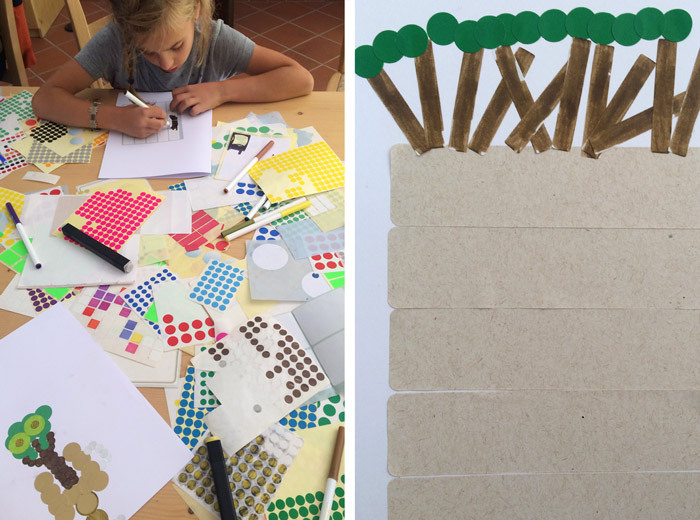 NEW workshop at the horizon for the brilliant Montagna Disegnata series by Giulia Mirandola Progettazione at the brand new special place in the mountains called Il Masetto. 12-14 August / Holiday-Workshop all included. For all the details > Il Masetto website (ita) ISCRIZIONI APERTE! "Un laboratorio per acquisire superpoteri e arrivare a disegnare quello che non si vede. Studio Fludd vi proporrà un esplorazione delle profondità della superficie delle cose naturali, coadiuvati dal giovane ed eclettico divulgatore scientifico Giovanni Gabelli. Verranno proposte esperienze di osservazione amplificata, alla scoperta di dettagli naturali minuti, sconosciuti e sorprendenti. Il disegno sarà utilizzato come potente strumento per rendere visibile cose altrimenti inaccessibili ai sensi non equipaggiati. Si misceleranno precedenti storici, nozioni sconosciute, esperimenti visionari e ricerche sul campo alla ricerca di texture invisibili da rappresentare con effetti speciali." NEW cover for VITA magazine - Montagna felix #07 issue, all about the renaissance of Italian mountain communities. We went for energetic textures on a positive growth chart. More about the making-of in this article by the art director Matteo Riva.